The culprit surfaced in the spring of 2018, leaving behind a trail of white dots on the stems of scallions, leeks, and garlic bulbs. 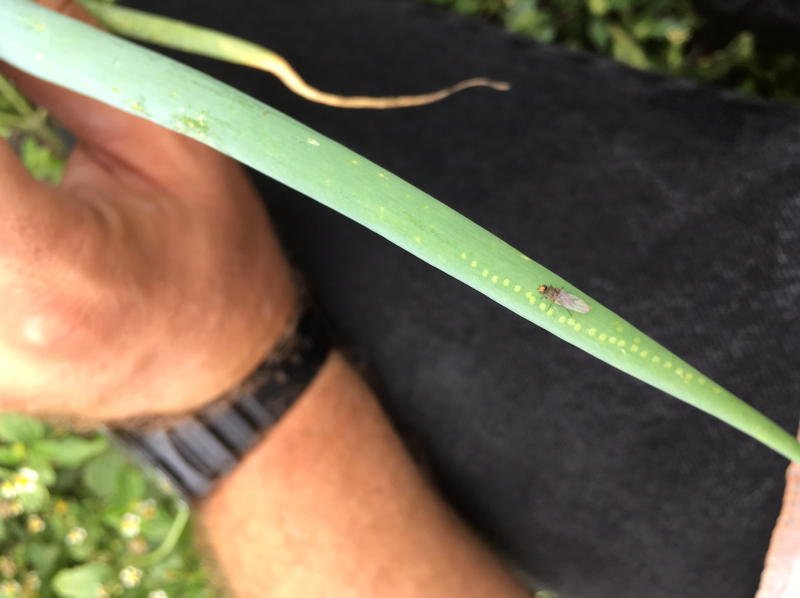 Jeff Arnold’s suspicions that the problem was Allium Leafminer, an invasive pest attracted to Allium crops from leeks and scallions to garlic and onions, were on the mark. A line of dots are made by the Allium Leafminer laying eggs inside the leaf tissue. (Photo credit: Cornell University) Click to enlarge. The clue is the “oviposition marks, which are made by the adults laying the eggs inside the leaf tissue. It is basically a line of dots on the leaf, a very unique mark that is not created by anything else,” says Arnold, the Farm Hub’s vegetable production manager. Allium Leafminer is a fly that lays eggs in Allium plant tissue leading to larvae tunneling through the leaves and eventual plant tissue rot. While not a health risk, the damaged produce cannot be sold at the market. At the Farm Hub the “damage was widespread but not severe,” Arnold says, noting that while an estimated 20 percent of garlic was infested, fortunately, the larvae did not make their way down into the garlic bulb. Unfortunately, the scallions and leeks did not fare as well. At the Farm Hub, Allium makes up only an estimated 3 percent of total vegetable acreage. That said, growers and researchers assert the ripple effect of damage can be tremendous for growers, especially when it comes to economic impact; a report from Cornell University on Allium Leafminer notes garlic is a $20 million crop and New York is the fifth largest garlic producing state in the U.S. Data and information on Allium Leafminer is scarce considering it was detected as recently as 2016 in the U.S.; the first case, at a farm in Ulster County, NY, was confirmed by Cornell researchers. To date, there are no definitive solutions to tackling the pest and no organic sprays available. Smaller growers can cover their crops as an effort to prevent the pests from laying their eggs there. Many growers whose fields have been infested have been trucking out the infested dirt and destroying Allium crops. Teresa Rusinek (center) from Cornell University Eastern New York Commercial Horticulture Program and Farm Hub staff. Rather than rid the fields of infested crops, the Farm Hub kept the leeks and scallions and agreed to host a fall research trial on Allium Leafminer designed by Cornell researchers from the Eastern New York Commercial Horticulture Program, with the goal of finding ways to tackle the pest. The trial involved examining management methods, from the timing of organic sprays to the use of reflective mulch, for leeks and scallions. 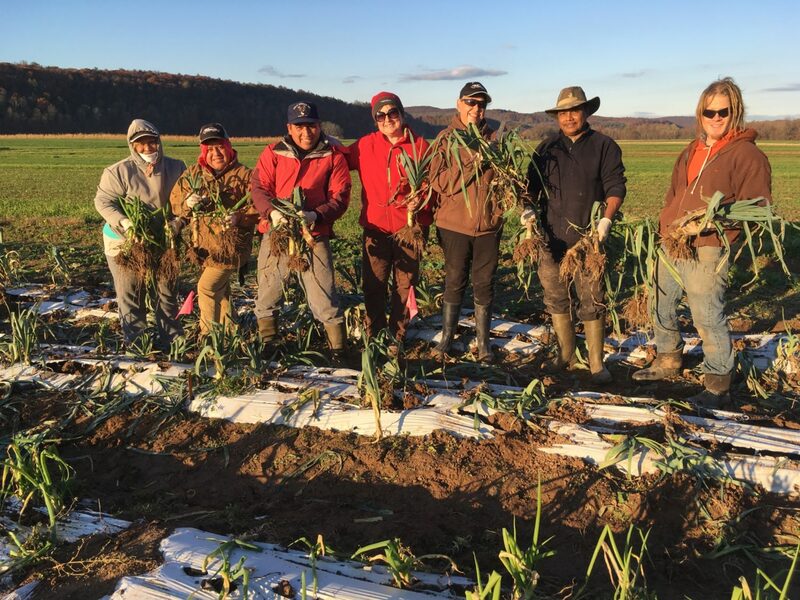 The Farm Hub and Cornell have now extended the research trial and are conducting a second phase in the spring, in which they will test garlic. The trial started in October when the garlic was planted, with researchers carefully observing when the garlic emerges and when the pest takes flight; Allium Leafminer takes flight twice a year – once in the fall and once in the spring. The Farm Hub plans to hold a twilight meeting on Allium sometime in June. 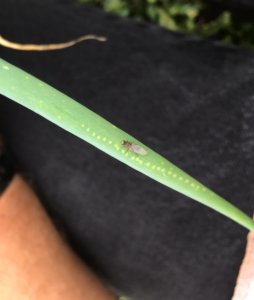 The research trial comes at a time when Allium Leafminer continues to spread and has been found in new counties including Seneca and Washington Counties in New York. It has already been identified in at least 13 counties in New York, eight counties in New Jersey, one in Massachusetts and 30 in eastern Pennsylvania. 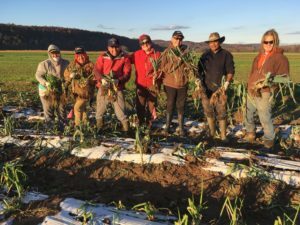 The economic impact could be tremendous for farmers, including those in New York’s Black Dirt region in Orange County famous for its onions. Here in the Hudson Valley, some growers have even stopped growing Allium, weighing the cost benefit of investing in pest management. Cornell researcher Teresa Rusinek, who is leading the research trial at the Farm Hub, said they seek solutions applicable to both conventional and organic farmers, both of whom stand to be impacted by the pest. Cornell is conducting a research trial at a conventional farm in Dutchess County, while the Farm Hub is serving as the research site as an organic farm. Information from both sites will benefit all farmers growing alliums as approaches to management often cross over organic and conventional production, Rusinek points out. “When farmers are managing pests they look for information on biology and strategies that are effective, economical and sustainable,” she added. The Farm Hub is a prime place to better understand the patterns of Allium Leafminer. “There’s a very healthy Leafminer population there, so that’s not great from a production standpoint, but from a research standpoint that’s phenomenal to have — to have really uniform pressure across that trial space,” says Cornell researcher Ethan Grundberg, who is working on the trial with Rusinek. In gearing up for round two, Rusinek points out that this time researchers will focus on garlic. They will continue to test the timing of a combination of two organically approved sprays, all reviewed and listed by the Organic Materials Review Institute. While too early to conclude, they are hopeful that reflective mulch may further reduce the need for conventional and organic chemical spray applications to manage the pest. In previous trials, the researchers compared reflective (silver) mulch to white mulch noting “a significant statistical difference” in the amount if egg-laying resulting in a decrease in ALM larva and Pupa found in leeks and scallions at harvest. The reflective material repels the female pests to lay eggs elsewhere, Rusinek says. They monitor the flight and intensity of the pest. With the help of the Farm Hub’s weather station, they collect growing degree data (a measure of heat accumulation that determines pest emergence and activity). 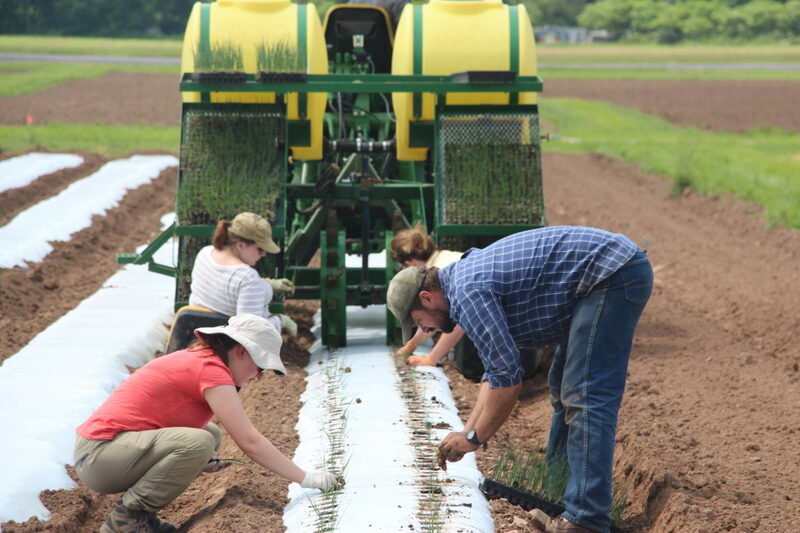 Ethan Grundberg (blue shirt) from Cornell University Eastern New York Commercial Horticulture Program and Farm Hub staff work on the Allium Leafminer research plots at the Farm Hub. While there will be enough data after the spring trial to share with growers, researchers are hoping to extend the trials on the Farm Hub beyond the spring, and replicate a fall trial with leeks and scallions. Preliminary results are expected to be released this winter in research papers and be used for factsheets to be made available to growers. Growers such as Jeff Bialas, who owns J&A Farm, a certified naturally grown farm in Goshen, NY, say the research in the pipeline is applicable to the livelihood of their farms. In 2017 Bialas reached out to Cornell after suspicious markings appeared on his Allium crop, and it was confirmed it was Allium Leafminer. Since then Bialas has been adopting preventative measures notably ProtecKNet (insect netting) along with using silver-reflective mulch. “We had zero damage,” says Bialas of the latest harvest, noting the measures appear to be working. J&A Farm, which follows organic practices, launched in 2010 with an estimated half-acre acres devoted to Allium crops. For J&A Farm Allium crops are a staple product, especially at the farmers market where they regularly sell produce on the Upper West Side. Bialas is keeping close tabs on the research trials at the Farm Hub, and says he open to trying new ways to combat the pest. Allium Leafminer was found an early as 1858 in Eastern Europe potentially originating from Poland. Since then it has been found in at least 21 countries in Europe and a handful of Asian countries. The pest was likely transported to the U.S. through the U.K., according to existing research.